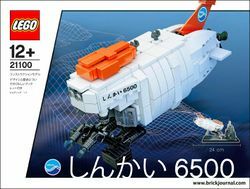 21100 Shinkai 6500 was the first set on LEGO CUUSOO to gain 1,000 supporters. It is based on a real-life submarine. The set was released exclusively in Japan. Only 10,000 copies of the set were made available. The banner on the CUUSOO website. Facts about "21100 Shinkai 6500"
This page was last edited on 24 July 2017, at 12:59.